This is a free kids club with lots of benefits for kids (14 and under) to enjoy all season long. Free Kids Club T-Shirt - Kids will receive a special FREE t-shirt voucher that will be emailed to ALL Kids Club Members. 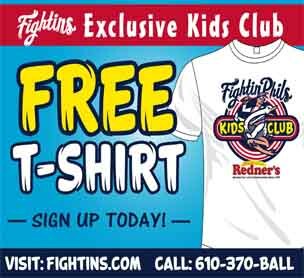 The T-Shirt will be handed out at the Redner's Kids Club Booth, when fans bring their emailed voucher to the game! Kids Club Email Newsletter - Weekly email newsletter containing fun facts, contests, family activities, and information about upcoming Kids Club events. Free Phunland Happy Half-Hour - Kids Club members will be able to play all Phunland games (excluding ring toss) free of charge during the first 30 minutes of every Happy Hour all season long. (Happy Hours are on Wednesday, Thursday, Friday & Saturday Games). Nightly Kids Club Winner - At every game (not only Sundays) Kids Club members in attendance can enter to win a nightly prize. Make sure you visit the Kids Club Booth located just inside the Main Entrance for your chance to win!